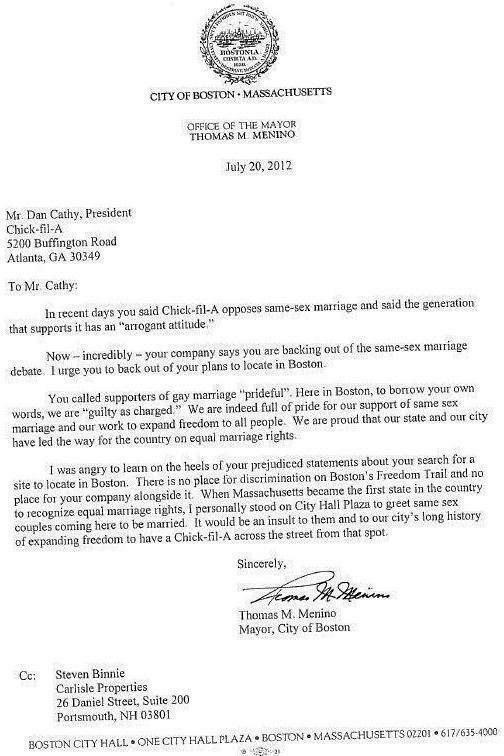 My former mayor, Tom Menino, is a fervent supporter of marriage equality. He recently wrote a letter slamming Chick-fil-A for effectively making opposition to marriage equality their corporate policy. This is via Boston’s community Facebook page; here is the image as I first saw it. What’s happening is that people are emailing, texting, and otherwise sending versions of the letter, and then uploading them to social networks. Each successive time a photo is uploaded to many of these networks, it’s compressed again into a jpg, and it loses a little more quality. The end result of this isn’t pretty, and it doesn’t help that Facebook’s photo compression algorithm is extremely aggressive. The take-home here is that once you find cool, sharable content, just link to it. Not only does the dude/dudette who made it/posted it get warm fuzzies from everyone’s attention, but it also keeps that cool, sharable content looking sharp and fresh. Life is too short for lossy images.